FQB "Pumpkin Patch" Collection welcomes Fall and all of its bright and beautiful colours! 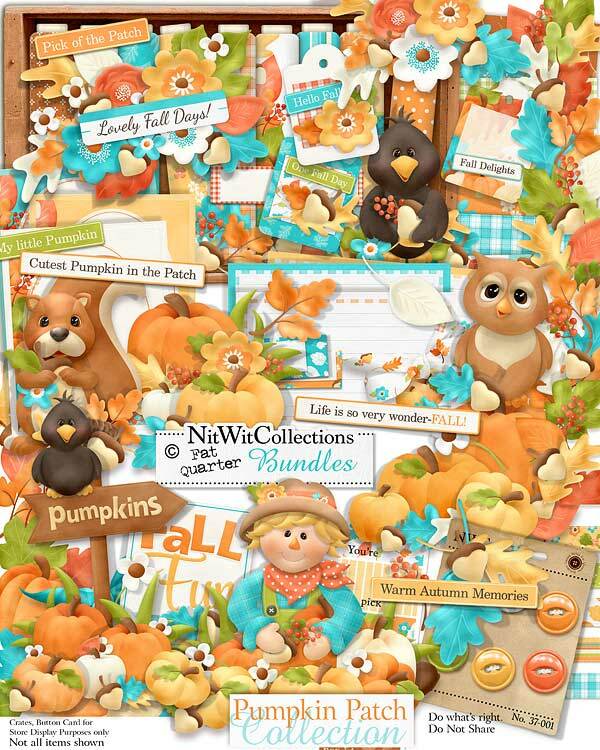 The Fall foliage, acorns and animals that we see, have gathered in this kit to help you to create wonderful cards, mini albums and scrapbook layouts! The numerous digital elements and background papers that this kit offers will help you to create such a variety of items. Are you looking for a little whimsy...well the scarecrow, squirrel and crow are there to help! If you are looking for something a little more realistic, our pumpkins, leaf clusters and flowers are sure to fit the bill. No matter which way your inspiration is taking you, you will be sure to have your "acorns gathered" with this splendid digital kit! 4 Bows, dressed up in their Autumn colours! 1 Cluster of Fall flowers and leaves...decorate, decorate, decorate!! 1 Cluster sentiment of flowers and foliage - "Lovely Fall Days"
1 Corner cluster that is quintessentially Fall with the leaves, pumpkins and more! 3 Journal strips that are left blank for you to fill in your sentiments, dates, etc! 11 Individual leaves from several species of trees. Choose your favorites, and don't worry they won't crumble apart when you are creating with them! 3 Beautiful mats that can be used as photo cards, journal mats, or stand alone pages in your scrapbook layouts, mini albums and cards to display just how you see fit! 1 Owl - we are glad there is only one in this kit cause whoooo'd get any sleep if there were more?? 10 Pumpkins...short ones, tall ones, white ones, and various shades of orange ones. Just like a U-pick farm! 1 Scarecrow doing his best job protecting the Fall bounty! 1 Sign post - "Pumpkins"
1 Tag - "Hello Fall"
1 Tag - "One Fall Day"
1 Tag - "Fall Delights"